Director/Screenplay – Clive Barker, Based on his Short Story The Last Illusion, Producers – Clive Barker & JoAnne Sellar, Photography – Ronn Schmidt, Music – Simon Boswell, Visual Effects & Makeup Effects Supervisor – Thomas C. Rainone, Makeup Effects – Alterian Studios, Image Animation, Steve Johnson’s XFX, K.N.B. EFX Inc & Tim Ralston, Production Design – Steve Hardie. Production Company – Seraphim/United Artists. Harry D’Amour, a private detective who specialises in the occult, is contacted by the wife of stage illusionist Phillip Swann who invites him to one of Swann’s performances. There D’Amour is witness as Swann is killed when a sword trick goes wrong. Investigating, D’Amour realises that Swann was a real magician who disguised his abilities by hiding them as stage illusions and that his death was no accident. Further investigation reveals the activities of the followers of the charismatic cult leader Nix who Swann banished to the pit thirteen years earlier. As D’Amour becomes more involved, he realises that Nix’s followers are in the process of raising their master from the dead. The jury may still be out as to whether Clive Barker is the future of horror – he has certainly faded from prominence in the 00s. On the page, Barker is capable of swinging between moments of breathtaking, blood-glistening brilliance – novels like Weaveworld (1987) and Imajica (1991) – and a frustrating failure to ignite ideas – The Great and Secret Show (1989) and Sacrament (1996). Many Clive Barker stories feel hurried and unfinished. Whatever the case, Stephen King was right in one respect, ironically his own, in that Clive Barker has been the only horror writer, with the exception of Dean R. Koontz, to have given King a challenge in the best-seller stakes. When Clive Barker is firing on all cylinders, his images are genuinely evocative. He conjures a grandiose Mediaeval vision of twisted depictions of the flesh that seem to come out of a worldview caught somewhere between Hieronymous Bosch and the Marquis de Sade. Nowhere in Barker’s horror do you find monsters of science, instead his are tortured visions that lie somewhere in the divide between flesh and soul. Nor in Barker’s horror do you find the innate safety – the return to the world as it was at the start of the story after the banishment of the horror – that dogs many writers like King and Koontz. Clive Barker was the first of the new wave of horror writers that were labelled Splatterpunk – his is a world of darkness where goodness does not exist, only dark and horrendous pain sometimes rent through with moments of transcendence. Hellraiser was a highly impressive directorial debut from Barker, a dark and gripping descent into forbidden desire that created a pantheon of memorable monsters and was all the more impressive for only having been made on a one million dollar budget. Sadly, it was a vision that no subsequent Clive Barker film has managed to match, despite all his other films having had far greater budgets. Barker’s second film Nightbreed (1990) had all the elements – an amazing array of creature effects and a mythically epic story – but failed to fire up. Away from Barker’s direct influence, other adaptations of his work have come across as diluted. Hellbound: Hellraiser II (1988) had some good moments, notably its vision of an M.C. Escher-esque Hell, but the subsequent sequels turned the Hellraiser series into another Elm Street franchise. Candyman (1992) was, like Nightbreed, another effort that had all the elements but never fully made them work. The sole exception to this was the adaptation of The Midnight Meat Train (2008). 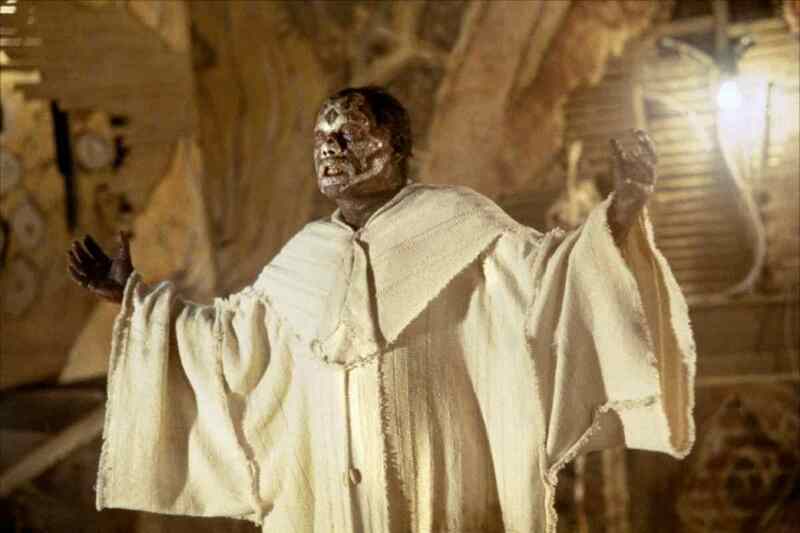 Lord of Illusions was Clive Barker’s third and to date last directorial outing. With the relative disappointment of so many other people’s adaptations of Barker’s work, the opportunity for the material to come from the source undiluted was something to be relished. Lord of Illusions certainly looked immensely promising. The Last Illusion (1985), the short story that the film is based on, is surprisingly slight. The story opens with the death of the stage magician who hides real sorcery as stage illusion; introduces Barker’s recurrent character of the paranormal private eye Harry D’Amour; and ends with D’Amour being pursued by phantasmagoric horrors from Hell. There is not much of a plot to the story – and the film throws most of it out anyway, only keeping the image of the magician being killed. However, Harry D’Amour is a great creation who at once suggests a blend of Barker-esque splatterpunk horror and the Humphrey Bogart/Dashiell Hammett detective story. Unfortunately, Lord of Illusions fails to ignite its promise. One wanted to like Lord of Illusions, they really did, but the film is disappointingly routine. It fails to work as a film noir detective story. For one, Clive Barker casts Scott Bakula. Scott Bakula, who was then caught in a career lull between his leading parts on genre tv series Quantum Leap (1989-92) and Enterprise (2001-5). Bakula always seems to slowly blink his way through a role – here he seems far too wholesome and cleancut to convince as a burned-out gumshoe here. Good noir stories like The Maltese Falcon (1941), The Big Sleep (1946), The Third Man (1949) and Kiss Me Deadly (1955) absorb one in their detective story but Barker does not seem interested in doing so. The film’s trail of clues seems half-hearted and lack any surprises. The most important element of noir is its atmosphere – the cliched ambience of twirling fans in low-lit rooms, slatted Venetian blinds and so on. Noir is about a journey through a morally decaying world – everything takes place in a seeming world of half-shadow that is intended to outwardly echo some sense of corrupted innocence inside the hero. The lighting and design of noir is probably its most important feature. Unfortunately, Clive Barker misses this atmosphere by a mile – the film is far too blandly lit. You suspect that what Barker was really wanting to make was something like..Angel Heart (1987), which does the whole gumshoe detective/horror mashup to perfection.. The one noir element that Barker does get right is Famke Janssen who alluringly incarnates noir’s embodiment of the impossibly beautiful femme fatale. Although the problem here is that Clive Barker does not appear interested in the romance – the coming together of her and Swann should have been the emotional centre of the film but isn’t. On the other hand, Lord of Illusions fails to work as horror either. One keeps waiting for perverse and grandiose Barker-esque visions to invade the film but, bar a ridiculously wimpy set of CGI geometric shapes, nothing happens up until the climax. Barker keeps trying to pump up the atmosphere by injecting annoying false jumps – the score vainly tries to turn a workman climbing up out of road diggings or Scott Bakula jumping into a hole in the ground into something scary. The entire film is a wait through a non-romance, an indifferent mystery plot and a lack of horror to get to its climax. However, even this is disappointingly routine – Daniel Von Bargen returns from the dead, floats about, kills a few people, comes out with a few Barker-esque imagery-laden lines about wanting to murder the world and briefly transforms into a Lovecraftian demon before being dispatched back into the pit. Routine stuff – average for every direct-to-video horror film these days. One expected more from Clive Barker – certainly, the film is utterly banal in comparison to the short story’s vision of the hero being pursued by a demonic horde from Hell. Considering that some five makeup studios have been brought on board to essentially only give Daniel Von Bargen a leprously black face, the results are considerably underwhelming. 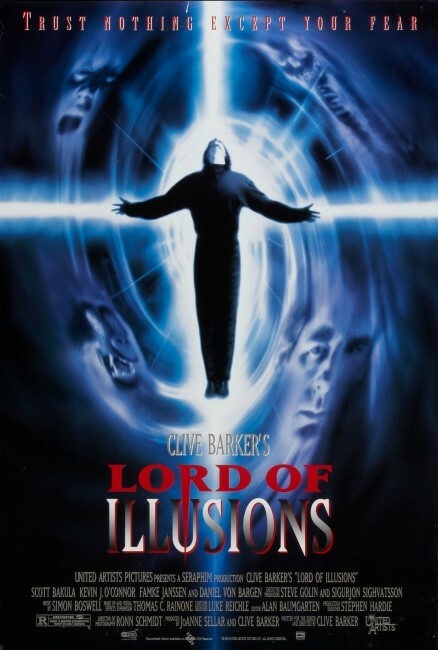 Lord of Illusions was Clive Barker’s last directorial work to date. Subsequently, Barker returned to writing novels, although has been sporadically touted as a director of various projects for more than a decade since, even though none of these has so far been greenlit so far. Other adaptations of his work have occasionally appeared, including the cinematically released The Midnight Meat Train (2008), Book of Blood (2009) and Dread (2009). Barker has also written one of the stories in the tv movie Quicksilver Highway (1997); acted as Executive Producer on Gods and Monsters (1998); wrote and produced Saint Sinner (2002); and produced The Plague (2006).